Everyone has their own story when it comes to learning software. I was mostly brought up on Mindmaze in Encarta as well as the games present in Dorling Kindersley titles. For example I played a version of Lunar Lander found in a space encyclopedia programme whose name escapes me. Then there was Reader Rabbit… now he was cool. Since edutainment has mostly gone the way of various games featuring Dora the Explorer it is fun to look at a title such as The Logical Journey of the Zoombinis which tries to engage the logical pathways in a child’s brain so that they will be better at mathematics… that’s the theory anyway. Now it’s time for a game whose gameplay showcases the trials and tribulations of a race, having been grown tired of the fascist regime in their native country, seek out pastures new. However, not everything is smooth for this proud race of blue potatoes mounted on wheels, rollerblades and fans. Oh no, they need to undergo trials and tribulations of lions, frogs and pizza demons in order to reach the Promised Land. If anything this is an allegory for Moses leading the Jews out of Egypt… just with logic puzzles. In other words, the grass is always greener on the other side, even if the other side involves allergic bridges, pizza-loving trolls and pairing frogs. The fact that bridges can be allergic to certain haircuts is a tad confusing. I wonder what the kids thought when they sat to play this in their computer labs. Maybe some saw this as a large complex metaphor… who am I kidding. Most of them were probably just happy to get out of learning the state capitals. I suspect this game would have been considered too fun for computer labs for most of them. It’s pretty obvious that this is an educational game since it is all about logical thinking. Then again… games such as Professor Layton are based on logic puzzles and yet are not considered ‘edutainment’. Despite the use of bright, colourful and customisable cut characters there is not too much of a difference between these games except for the target audience. I mean, The Logical Journey of the Zoombinis is most definitely meant for the 8-12 age bracket but as the difficulty rating increases it is still fairly challenging for some adults. Some puzzles remain the same and others you just wish didn’t exist (yes mirror level my bony finger is pointed at you) but in the end there is a good mix of them here. The difference here is that this game is clearly intended to teach you the logic reasoning – through specific puzzles and repetition, slowly expanding on the basic concept – the difficulty increasing it a good example of that. A game like Professor Layton is focused on solving the puzzles, and having different ones – there’s no repetition and you don’t continue to focus on similar skills to keep solving more difficult puzzles. With that said, we won’t spoil the puzzles entirely – they are easy to work out and quite fun to do. And if you feel it’s easy at the start – play through them a few times and the difficulty gets increased, in some cases considerably so. Stick with it! Another reward of its own are the graphics. As said, the zoombinis are made up of blue faces where you can choose between five hair styles, five noses, five eyes and five different shoes/feet. Seeing them move around, and cheer as you win, is cute and quite surprising for some. More so, there are a number of backgrounds and other animations that are gorgeous, with the lion (you’ll see it when you get there) being absolutely stunning. Last, the village you end up at the end is pretty, and gets filled up with more buildings as you get more Zoombinins transferred. It’s worth going through for that. When it comes to teaching children logical thinking this game is pretty much the title of choice and the only one that is remembered. Is it because it’s cute? Is it the enchanting gameplay and puzzles? Is it because of the customisability? All this and more! I am not to ashamed to admit that although I am not in the right age bracket for this game I enjoyed it a lot. It’s one of those titles to save up for when you have children of your own. It also makes for some great Easter egg ideas for a few weeks time. I mean why not create your own cute Zoombini and send them on their merry way? That would be too cute! 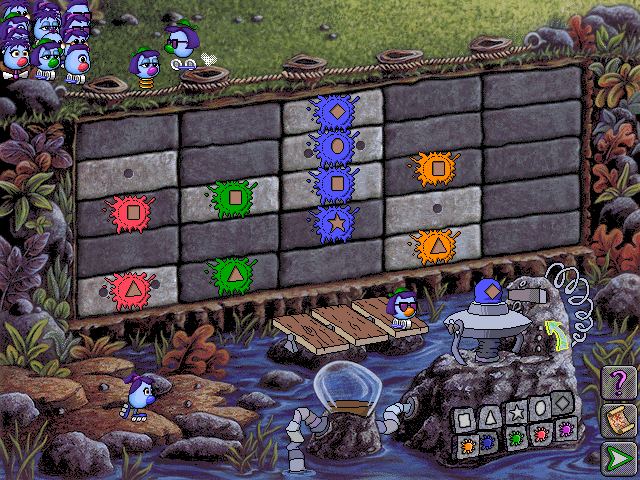 There is nothing wrong with a bit of Zoombinis! I have this AND Zoombinis Maths Journey, which is pretty similar in terms of playability, but with different puzzles. I have never gotten more than 500 Zoombinis across completely though, I seem to forget, or my computer decides to die on me in horrible ways.